Measuring instruments with WIKA inductive contact devices may be used in operation rooms subject to explosion hazards in danger areas of Zone 1 and Zone 2. 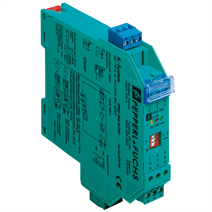 Provided they are supplied from a suitable and certified control circuit (e.g. WIKA control device of type 904.15). Besides the Ex areas WIKA inductive contact devices are primarily used where it is crucial to obtain especially safe contact with high switching frequency. Since the contacts function in liquid filling, they can be used even under very specific operating conditions. Some typical application fields are chemistry, petrochemistry and nuclear facilities. The WIKA inductive contact device is a contact-free device. Basically, it consists of an initiator, located on the nominal value pointer, including its fully potted electronics and mechanical construction with a movable control vane. The control vane is moved by the instrument pointer (nominal value pointer). The initiator is supplied with DC voltage. If the control vane moves into the clearance of the initiator, its internal resistance increases (= activated state / the initiator has high-resistance). The change in the current rating arising from this is the input signal for the switching amplifier of the control device.